Larry Nassar, ex U.S.A National and Olympic team physician was convicted on ten counts of sexually abusing minors. The damage that he inflicted upon the survivors and their families lives are immeasurable, but his reign of degrading terror come to an end thanks to a courageous young lady who saw an opportunity to speak out. 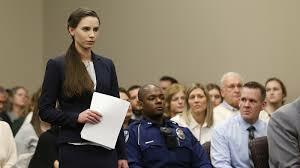 Rachael Denhollander, was one of Nassar’s victims and the first to publically speak out. She was a 15-year-old gymnast when she sought treatment from him for lower back pain but he used it as an opportunity to sexually assault her. These assaults continued for a year and she never told anyone, that was until one day 16 years later she saw the first chance to be believed and filed a police report against him. The opportunity came because a newspaper did a damning investigation into the culture of abuse in gymnastics. The reason I share Rachael’s story with you is not only because of her immense courage and bravery in speaking out against the perpetrator of her abuse, the gymnastic authorities and governing bodies that were complicit and responsible in providing the environment that enabled Nassar to abuse and go unchallenged in his behaviour, but because of what her actions led to in taking that opportunity. She helped 140 young women find their voice by coming forward and each of them gave sworn testimony that saw Nassar sentenced to life without parole. She did not come forward anonymously, recognising in order to add power to her testimony and to highlight the incompetence of those authorities, she would have to show her face, give her name and talk about her abuse openly. She was called names such as ‘a media whore’ and ‘attention seeker’ all whilst under intense public scrutiny, but it was the price she was willing to pay for the opportunity. If you are a survivor of childhood sexual abuse, there is a way I have found that you can have the opportunity to tell someone what happened to you without having to pay such a heavy price. I recently took part in The Truth Project, part of the Independent Inquiry Into Child Sexual Abuse. It gives survivors the opportunity to come forward confidentially to talk about their experience. This can be done in a number of ways- by phone, letter, email or private face-to-face sessions. They provide support and are clear with you on what it involves. The process is designed to empower the survivor, meaning you get to choose the means by which you tell your story, when you tell it and how much you choose to tell. It is also an opportunity for you to say what you believe could have helped or protected you from abuse at that time, or what you feel authorities or those in position of power could have done better. You don’t have to give the name of your abuser should you not wish to, but it is a chance for you to speak out, break the silence and start your journey to healing. Unlike Rachael, you can do it without anyone knowing apart from those involved in The Truth Project. The opportunities to speak out are few and far between for us as survivors and we need to do so while we can. Too often like Rachael as survivors, we wonder if we will be believed, as we have seen countless times those who have spoken out before us treated appallingly like they are the perpetrator of their abuse. We hear and see the scorn and denial of others who have never had to experience the violation and trauma of sexual abuse. It is the only crime where a “your word against theirs” approach is taken in court because for many victims and survivors our injuries and more often than not psychological not physical, and because of fear, guilt and shame, like Rachael it has taken years to speak out; and that often creates doubt. This is our opportunity to collectively use our voice to have a chance in being a part of something that could bring about real change in the processes of organisations that fail to report sexual abuse and also challenge the ‘turn the blind eye’ mentality that has been allowed not to hold someone accountable for not reporting suspected abuse. Too many of us have been failed by the police, Crown Prosecution Service, family, schools and others who were supposed to protect and help us put the perpetrator of our abuse behind bars. We can now open the door to help victims by being part of this process that will hopefully learn from the failings and enable better support and help for future generations. We may never see justice but we can let our voice be heard. Because as we have seen from the actions of convicted child abuser Nassar and the courageous and bold Rachael, opportunity can either be used for good or evil.